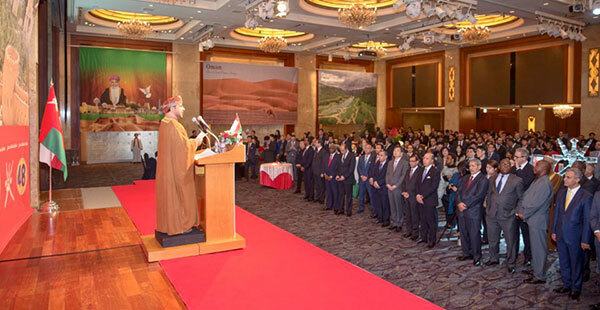 The Korean guests at the Omani National Day reception at Lotte Hotel in Seoul were pleasantly surprised at the impeccable Korean language ability of Ambassador Mohamed Alharthy of Oman at a reception he hosted at the Crystal Ballroom of the Lotte Hotel in Seoul on Nov. 22, 2018 in celebration of the 48th National Day of his country. He gave his welcome message in perfect Korean, which was followed by an Omani version with interpreterations in English and Korean on the screen. 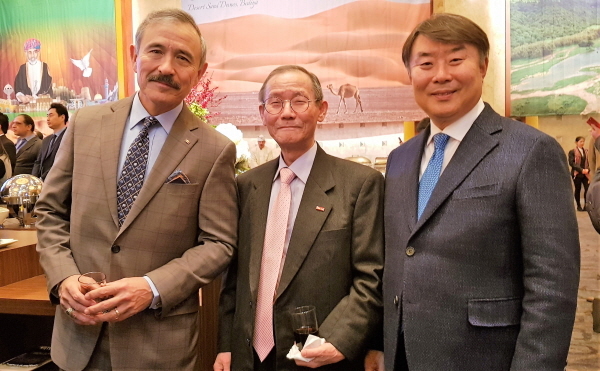 Ambassador Mohamed Alharthy (11th from right, front row) poses with other ambassadors and Korean guests at the National Day reception on Nov. 22, 2018. 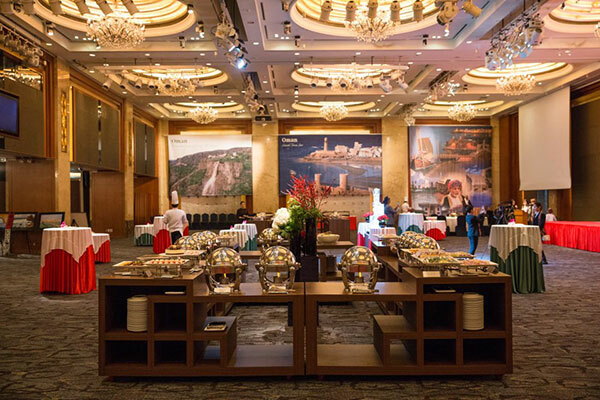 The reception was attended by many important guests from the Korean goverment and various other segments of society. Among them were First Vice Minister Cho Hyun of Foreign Affairs, FCEO Ha Seong-han Asia International Co., Ltd, President Hyeng-seob Jang APLUSTECH Company Limited and Vice President Lee Jung-ho of Hanwha, Publisher-Chairman Lee Kyung-sik of The Korea Post media with his editorial team, and Director Yoon Joo-mok of the Shincheonmi Church (concurrently an editorial writer of The Korea Post on religion). 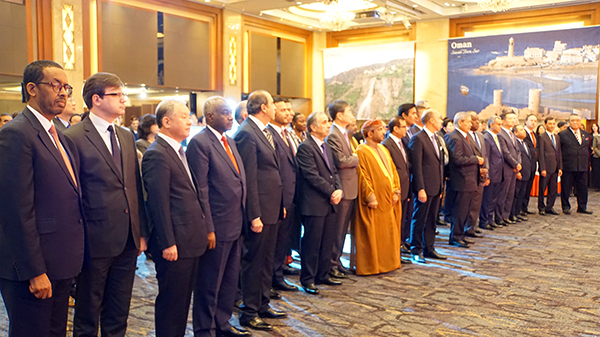 Ambassador Mohamed Alharthy (9th from right, front row) poses with other ambassadors and Korean guests at the National Day reception on Nov. 22, 2018. There many ambassadors present with their spouses, who included: Ambassadors Antoine Azzam of Lebanon, Abdulla Saif Alnuaimi of UAE, Adel Mohammad Adaileh of Jordan, Riyad A. H. Almubaraky of Saudi Arabia, Chafik Rachadi of Morocco, Vitali Fen of Uzbekistan, Harry B. Harris Jr. of the United States of America, Raul S. Hernandez of the Philippines, Peter Lescouhier of Belgium, and Daul Matute-Mejia of Peru. Ambassador Mohamed Alharthy of Oman delivers a welcoming speech to the guests. 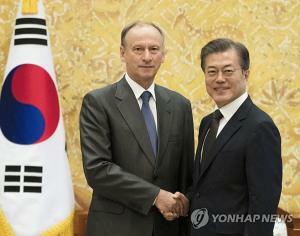 HE Cho Hyun, First vice Minister of Foreign Affairs, Representative of the Korea government, Honorable members of the National assembly, Excellencies Ambassadors and distinguished members of the diplomatic corps, Representatives of the governmental and private sectors, the cultural and media institutions and civil society, Distinguished guests. 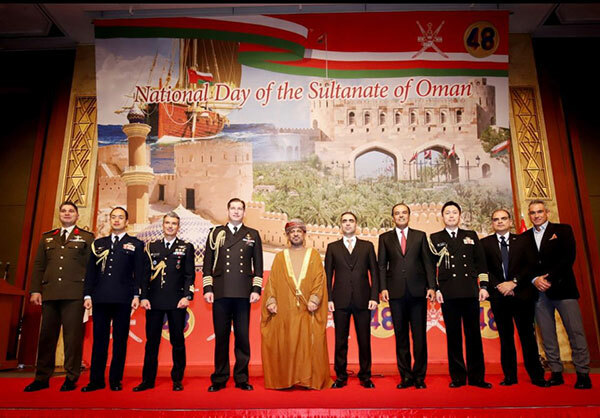 At the outset, I’d like to extend my sincere thanks and appreciation to all for your gracious participation on this meaningful day, in which the Sultanate of Oman celebrates the 48th National Day of its modern renaissance. 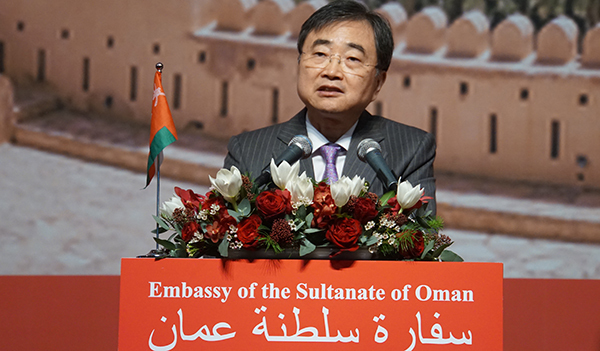 First Vice Minister Cho Hyun of Foreign Affairs delivers a welcoming speech to the guests. The march of the modern Omani renaissance of Oman continues under the wise leadership of H.M Sultan Qaboos bin Said to achieve further progress and prosperity in all aspects of life and providing a broad base of infrastructure and services, beside the establishment of a state of institutions and law, to allow the Omani citizens to fulfill their role and participation in the development and decision-making. Ambassador Mohamed Alharthy (8th from left, front row) poses with other ambassadors and Korean guests at the National Day reception on Nov. 22, 2018. The Oman foreign policy principles are based on building bridges of friendship and cooperation with various world countries, based on mutual respect, common interests, standing always with the side of right and justice, and non- interference in the affairs of others. Besides working continuously with world countries to contribute in the settlement of disputes and conflicts through means of dialogue, and negotiations and promote the values tolerance, coexistence and peace. Ambassador Mohamed Alharthy (6th from left) poses with other ambassadors. Oman is highly respected in the international arena for its wise diplomacy to the cause of world peace. It has been widely praised for its efforts in this regard, which have made it a meeting point and an oasis of dialogue and peace. Ambassador Mohamed Alharthy (5th from left) poses with other Military attaches. Oman's economic policy is based on economic diversification and openness to world markets. Industrial zones and free economic zones offer many projects and investment opportunities in various sectors such as industry and logistics, tourism, minerals and fisheries, energy and technology. There are many encouraging incentives, including strategic geographical location, security and political stability, and many facilities to attract foreign investment. Ambassador Mohamed Alharthy (2th from right) poses with other guests. 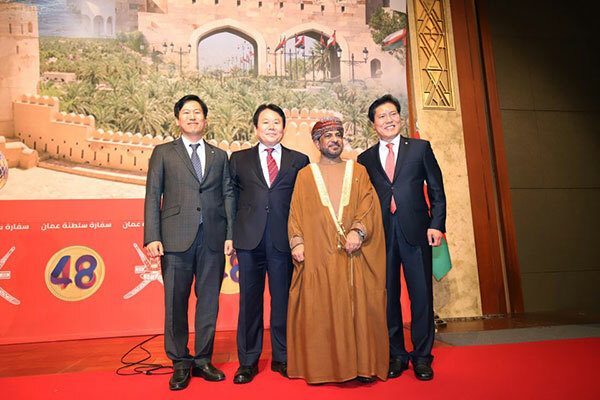 The Omani-Korean relations have developed in various aspects, and the contribution of Korean companies has increased in various projects in Oman. 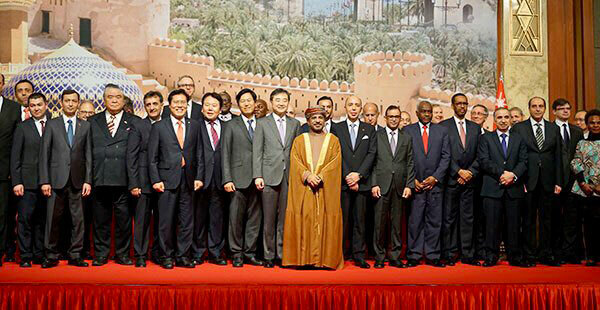 In the culmination of the cordial relations between the two countries, was the visit of the Prime Minister of the Republic of Korea, HE Lee Nak Yun, to Oman last July as many topics were discussed, beside the Oman-Korea business forum that was held during the visit and the signing of MOU of the cooperation in smart cities. In the context of the continued interest, the Republic of Korea has witnessed high-level visits and participations from Oman. The Omani Investment Forum was also held in cooperation with the Oman's Embassy and KCCI. There is no doubt that visit exchanges and the available projects and investment opportunities beside the encouraging incentives and the keenness of the two sides to the partnership represent a motive for expanding the horizons of cooperation and partnership to broader and more comprehensive areas. 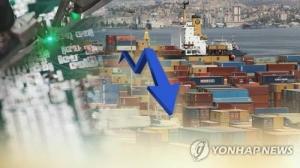 We hope that the Korean companies will take the initiative of these opportunities. The embassy of Oman is keen to provide all necessary facilities. 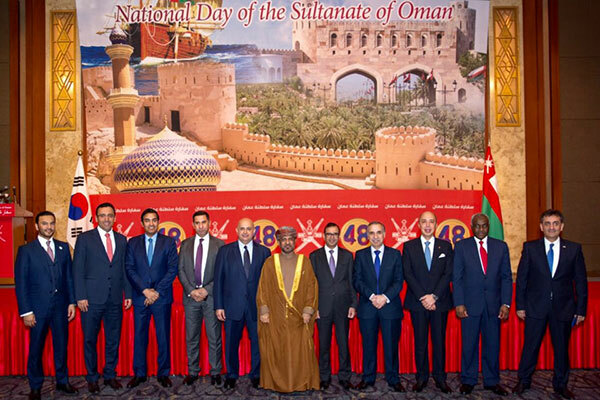 Ambassador Mohamed Alharthy (2th from right) is welcoming the guests at a reception on the National Day of Oman on Nov. 22, 2018. In this regard, I would like to point out to the tourist elements in Oman, which are characterized by their diverse geographical nature, beautiful geology, unique heritage, and the warm Arabic hospitality, and welcome all of you in Oman. Ambassador Mohamed Alharthy (3th from right) poses with First Vice Minister Cho Hyun of Foreign Affairs (2th from left). In conclusion, I’d like, once again, to express my thanks and appreciation to the Korean Foreign Ministry, all governmental and private institutions, and to the Korean people for their continued support and cooperation. Special thanks to all of you for your presence. We wish you a pleasant time, and for Omani-Korean relations, further development and progress, and for the whole world security, stability and peace. May peace be upon you all. Thank you. 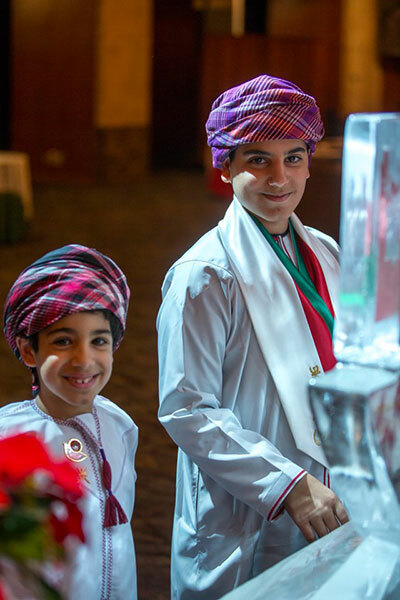 Ambassador Mohamed Alharthy (left) speaks during an occasion of the National Day of Oman on Nov. 22, 2018. Your Excellency Mohamed Al-Harthy, Distinguished guests, Ladies and gentlemen, I am honored to speak on behalf of government and people of the Republic of Korea on the 48th National Day of the Sultanate of Oman. Family members of Ambassador Mohamed Alharthy. His Majesty Sultan Qaboos bin Said Al Said is a leader who always prioritizes on the well-being of the Omani people. As a result, Oman has entered era of a "Blessed Renaissance." With its neighbors, Oman plays the valuable role of “mediator” in the region. 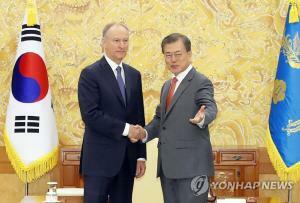 Korea is also honored to be a good friend with such a noteworthy nation. Family member of Ambassador Mohamed Alharthy. Distinguished guests, Ladies and gentlemen, Though the Republic of Korea and the Sultanate of Oman established formal diplomatic ties in 1974, our relationship extends much further back- nearly a thousand years in fact. 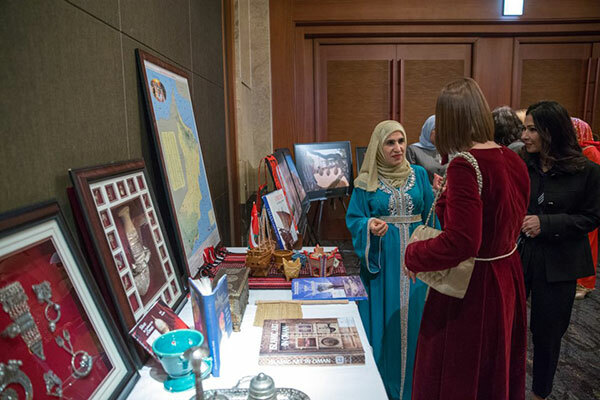 Ambassador Mohamed Alharthy (right) explains the handcrafts of Oman with First Vice Minister Cho Hyun of Foreign Affairs. According to historical records, trade between Korea and Arab countries began during the Korea’s 9th century Shilla dynasty. 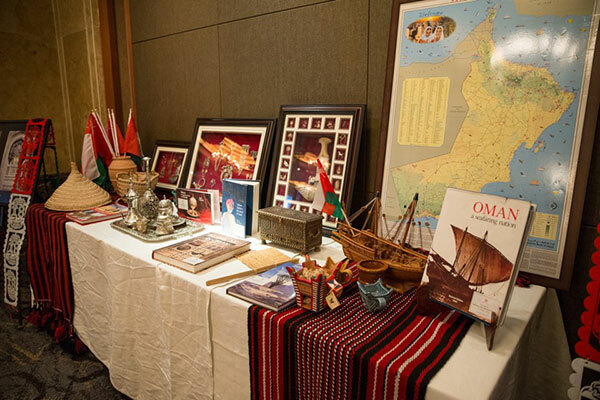 Considering Oman’s advanced technology in ship-building and marine navigation at that time, academic community thinks that Oman was Korea’s one of the important trade counterparts. In 1966, frankincense, Oman’s famous product at that time, was also discovered among the relics of Shilla. 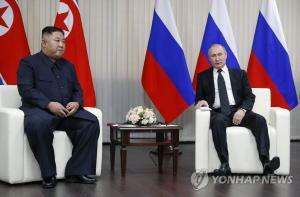 Our long-established relationship has led to our strong bilateral cooperation today, notably in the area of energy. Today, Oman is Korea’s 3rd largest supplier of liquified natural gas (LNG), and Korea is Oman’s 3rd largest export partner. 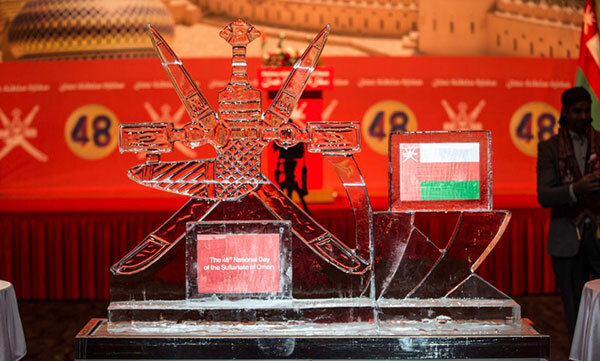 Logo ice work of Oman at the reception venue. Our friendship extends beyond energy cooperation. 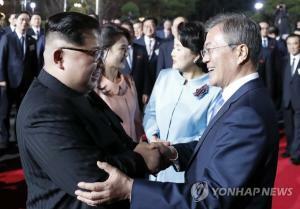 Over the past two years, the Speaker of the Korean National Assembly, Chung Sye-Kyun, Chairman of Majlis A’Shura, Khalid bin Hilal al Maawali and Korea’s Prime Minister, Lee Nak-Yeon have made official visits to each other’s countries. In 2018, the two capitals of both countries, Seoul and Muscat, joined hands officially as friendship-cities. 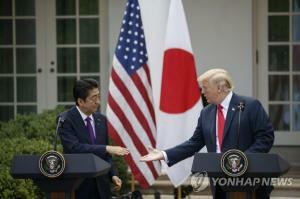 Given such exchanges, I hope our two nations continue to upgrade our relationship in new areas such as renewable energy, smart city, cyber security, and medicare. Distinguished guests, Ladies and gentlemen, There is a proverb that reads “a friend in need is a friend indeed.” Oman is such a friend. In 2011, it was with Oman’s assistance that the Korean Navy rescued our hostages from Pirates near the Gulf of Aden. In turn, we would like to reciprocate the friendship by playing an active role in the success of Oman’s Vision 2020 and the Development of Duqm. 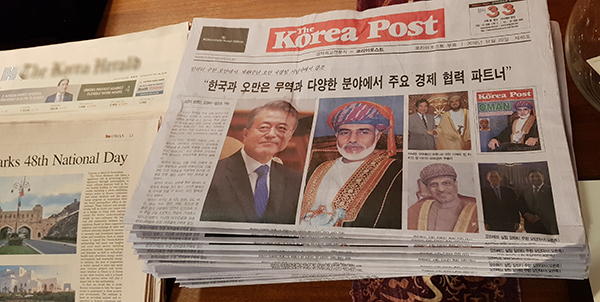 The Korean-language newspaper edition of The Korea Post featured the Omani National Day on its front cover page and also on the center-fold 10-11 pages. Distinguished guests, Ladies and gentlemen, In closing my remarks, I would like to extend my best wishes for the continued health and happiness of His Majesty and for the everlasting friendship between our two countries. Shukran Jazilan! 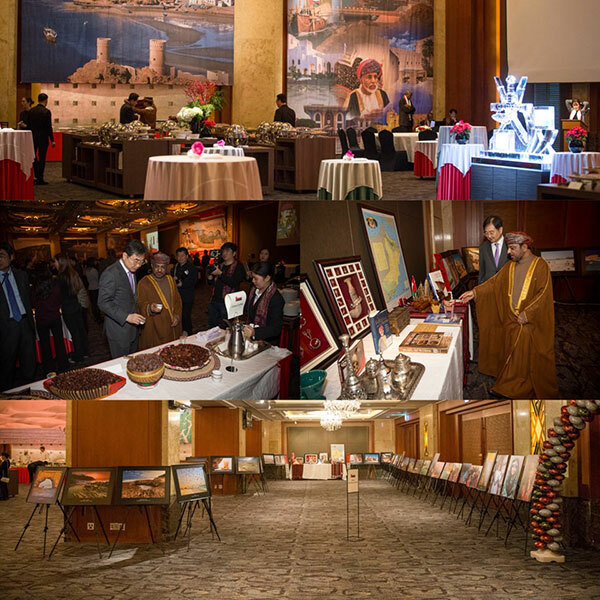 From up to down, reception of national day of Oman, Ambassador Mohamed Alharthy and First Vice Minister Cho Hyun of Foreign Affairs, The photo Exhibition of Oman.